Preheat oven to 160°C (325°F). Place the butter, sugar, lime rind and vanilla in an electric mixer and beat for 10–12 minutes or until pale and creamy. Scrape down the sides of the bowl and add the eggs, one at a time, beating well after each addition. Beat for a further 3–4 minutes or until well combined. Fold through the almond meal and pistachio meal until combined. Spoon the mixture into a lightly greased 29cm x 7cm x 8cm tin lined with non-stick baking paper. Smooth the top with a palette knife and bake for 1 hour–1 hour 10 minutes or until an inserted skewer comes out with a few crumbs attached. Allow to cool completely in the tin at room temperature. 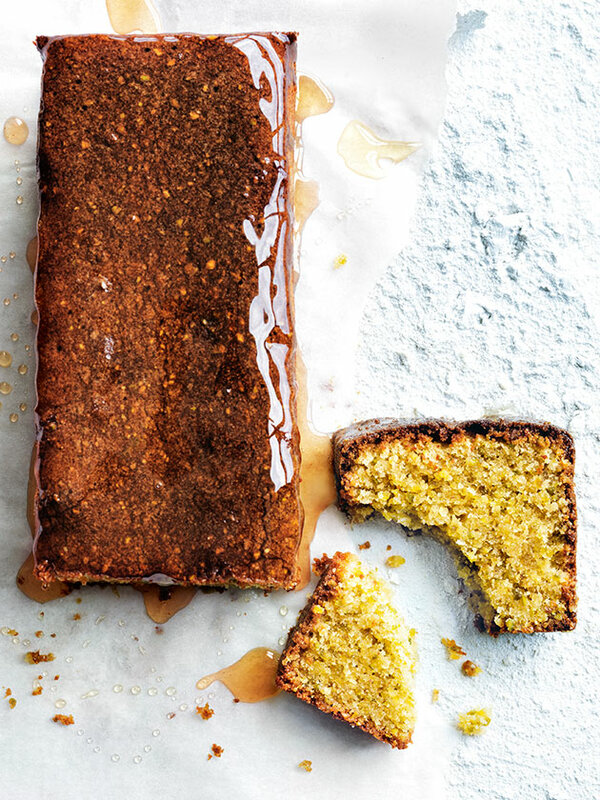 Carefully remove the cake from the tin and drizzle with honey to serve. Serves 6–8. +It’s not always possible to buy different nut meals, but it’s very easy to make your own. Simply process the required quantity in a food processor until a fine meal forms. Store any leftover meal in an airtight container, as you would flour.